Amanda Spratt of Australia and Team Mitchelton-Scott Orange leaders jersey. AMANDA Spratt is the undisputed queen of the Santos Tour Down Under. The 31-year-old Australian claimed a hat-trick of crowns when she remained cool under pressure in a sizzling hot peloton which endured sweltering conditions during the 42.5km stage 4 on Sunday. 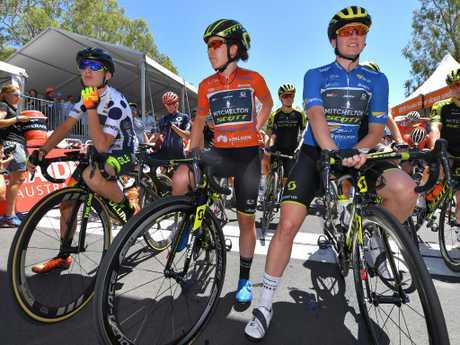 The Mitchelton-Scott two-time national road champion was well protected by her Australian team during the finale on the East End street circuit with Chloe Hosking claiming the final stage win. "I'm much more excited than the crit (criterium) last year," Spratt said. "I stayed upright and it was fun to be out there trying to help out (teammate and sprint jersey leader Sarah) Roy. "Everyone on my team is strong in their own right and when we really come together for a team goal - everyone just executing it and committing - it's wonderful to be a part of. "It's a home race, we're an Australian team so it's really special. Mum and Dad are here and I've got people from the Blue Mountains here as well." With Spratt's hat-trick of Tour wins setting a new benchmark, Hosking, 28, was ecstatic with her stage victory. Nadia Quagliotto, Amanda Spratt and Sarah Roy before Sunday's final stage. The Ale-Cipollini gun claimed the same criterium stage last year. She made her intentions clear early on when she breezed to the first Ziptrak sprint on lap 6 before claiming the stage. "It's a race which isn't suited to me. 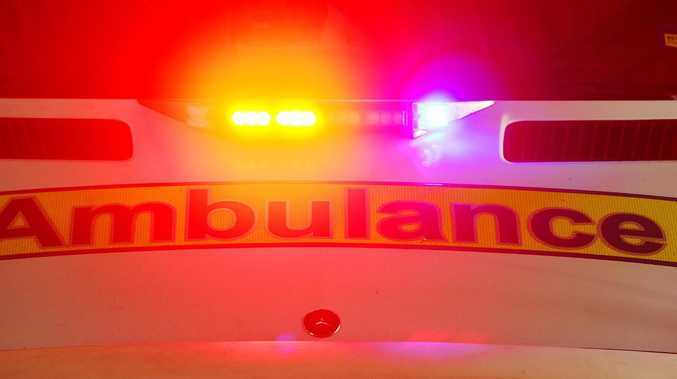 I would have preferred a harder race so some of that sting was taken out of the girls' legs,'' Hosking said. "But I felt super good. I did feel a bit of pressure because I haven't delivered in any of the other stages. "I didn't want to finish this Tour with nothing to show to my team because they've invested a lot of time and money to support me and support racing in Australia. "It wasn't external pressure; I'm one of these internally driven people and I put it on myself. I wasn't feeling any from the team, it was just me building that up." 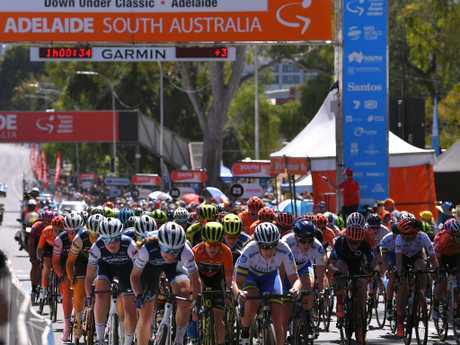 Before the men's peloton blows off its preseason cobwebs in the Down Under Classic - the prologue to the six-stage race which starts at North Adelaide tomorrow - the women bore the brunt of the scorching mid-afternoon heat on the searing tarmac. And there was drama. 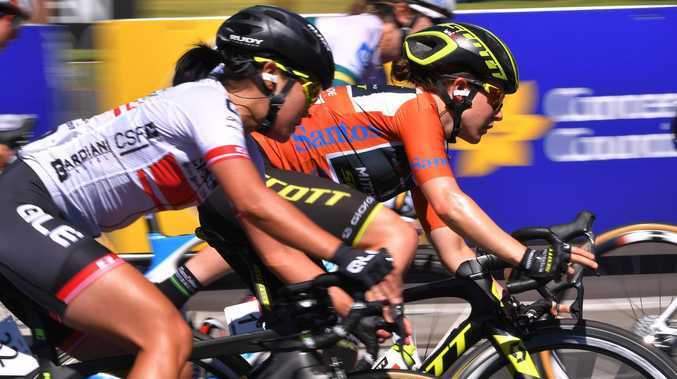 As Aussie Rachel Neylan, 36, was jostling for second spot in the sprint, she crashed heavily to dash her hopes of beating Spratt in the general classification. The UniSA rider tangled with the stage 1 winner, Trek-Segafredo's 19-year-old Italian Letizia Paternoster, American Tayler Wiles, 29, also of Trek-Segafredo, and Briton Alice Cobb, 23, from Team TIBCO-Silicon Valley Bank. Riders take to the Adelaide cstreet circuit course on Sunday. Roy, the sprint jersey leader before the stage started, claimed the second sprint of the 25-lap race, 1.7km circuit before the criterium picked up pace on the bell lap before the third sprint. Hosking added more time bonuses to her tally before the bunch prepared the grand finale seven laps later. She was far too good, ending the hour-long race with the freshest legs. "It was a sprint that I had to fight for and find the gap and really push through to the line,'' she said. "After the first stage I wasn't happy so I went back and watched a lot of sprint videos and I knew I didn't follow my instincts. So I followed my instincts on stage 4."